Empuriabrava is the place where my passion for traveling started. My parents got divorces when I was 6 years old. After two years, my mum found a new man and we started a new chapter in our lives. His father owns a house in Spain, Empuriabrava. Since that year we went to his house every year. My stepfather has also a sister with 4 children of the same age as my sister and me. You can image that our summers were awesome! Every time I come back to this place, the childhood memories are here too. When we got older, we started exploring other places in the world, so we didn’t go to Empuriabrava every year anymore. Today it was three years since I’ve been here, but now that I am, I’m back for trip down to memory lane. In this blog post I want to show you what this area in Spain has to offer. Empuriabrava is a very luxurious Spanish city, not too far from the French boarder. This coast town is part of the municipality of Castello d’Empuries. It is surrounded by a lot of medieval and very beautiful towns, great beaches and magnificent buildings. Empuriabrava itself consists of 24 kilometres canals. Houses are built around the canals and almost everyone here has his own boat to sail the sea. Our favourite activity here in Spain is sailing the boat. Our grandfather has his own boat and when the weather is absolutely fine, we go out on the sea. Sail along the coastline with a beautiful view over the villages and the rocks. Figueres is one of the bigger villages in the surrounding of Empuriabrava. In this city was the famous painter Salvador Dali born and he died here too. So the biggest place of interest is probably the museum with the biggest collection of the painter. Figueres was founded in 1279 and during the Spanish Civil War the city was repeatedly bombed. Since 1950s the city recovered and discovered by tourists. Every Thursday there is also a nice market with clothes, jewellery, handbags, hats, sunglasses,… where you can stroll around. Girona is a city full of history. It is the capital of Catalonia and is very popular for tourists. If you visit this acient city, you will immediately understand why. There is a beautiful historical centre that is dominated by the imposing cathedral and medieval buildings. And a lot lot more… I will write a full blogpost about this city later! 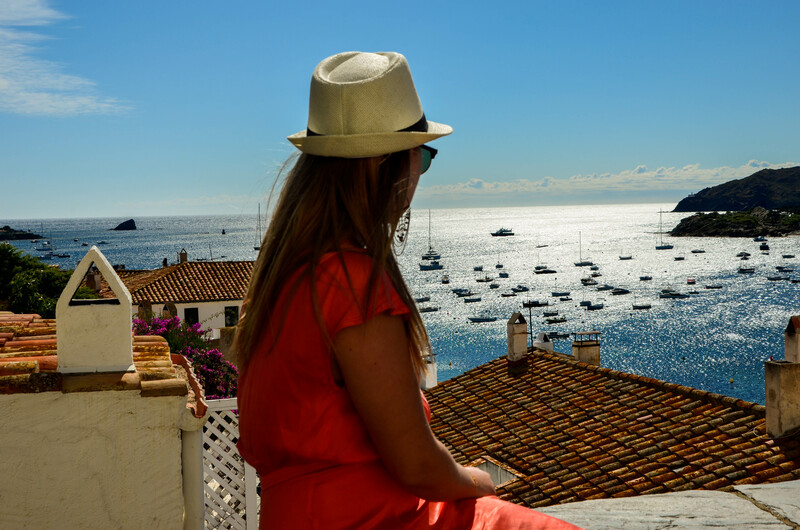 Cadaques is known as one of the most scenic villages along the coastline of the Costa Brava. It is a former fisherman village and is famous as the residence of the artist Salvador Dali. Stroll around through the small alleys of the white villages where you can find a lot of cosy boutiques and art galleries. If you are up for a small hike you can also go to Cabo de Creus. Between the rocks and cliffs there is paradise. It is a great viewpoint and you can go down again to the bay where you can swim in the crystal clear waters. Besalu is probably the best preserved medieval town of Spain. Cobbled streets and beautiful facades… the village is very nice for an afternoon of strolling around. Nice boutiques and cute little restaurants, do you want more? The trademark of the city is the 12th-century bridge that gives you access to the centre of the town. Besalu is declared a National Historic-Artistic Ensemble because of its architectural value. There are a lot of beautiful hikes you can do in this area of Spain. When you go from Empuria Brava to Olot, you will find a lot of mountains. These pictures are taken on one of the most stunning viewpoints I’ve ever seen in Spain. Best part? No tourists here! On Sunday we went to a dog shelter to pick up some dogs to go for a walk. We got 4 dogs, Kira, Sky, Quito and one from who I couldn’t understand the name. I don’t need to tell you that these ones were extremely happy to go out for a walk. The weather was nice and the views were gorgeous, so we did a walk of around 9 km. A lot of us in the heat, but also for the dogs it was a long good walk. I bet they will sleep very well now. Although I’m not really a dog person, but I turned into a crazy dog lady for a few hours. Not too far away from Empuriabrava there is a small village called Navata. The weather was not too good, so we decided to try a real Catalan breakfast… well I can tell you, if you had this breakfast, you don’t need to eat for the rest of the week. All kinds of sausages, hot and cold, with bread, garlic, tomato and aioli. No coffee or tea to drink, but wine, red or rosé and some soft drinks. They used to give you fries with it too, but lucky us… they stopped doing that. That would be too much to start the day with. Although you need to eat a lot, it is a must to here. The location is absolutely gorgeous and the experience is so nice! (Price: around 10 euros p.p). If you like some adventure and some action, you will find it here. The wave is a club with an artificial wave where you can learn to surf an become a real surfer(boy/girl). It is also very cosy and nicely decorated to just have a drink and watch people fall. Next to the wave you can go indoor skydiving. If you don’t like to do this yourself, it is always nice to go have a drink in the bar and see other people doing it. The instructor teaches the people how to do it and afterwards they give a little show for you. Very nice to see actually! If you are ready for the real work… Empuria Brava is famous for its skydiving. Even the Belgian military come here to train. Almost every half an hour you see a small plane in the air and only a few minutes later the sky is full of people hanging on a parachute. Every now and then you can here them scream of excitement or fear. Only during the summer months the casino at Peralada (Yes, where the cava & wine is from), offers a nice Mediterranean buffet dinner (called, restaurant La Parrilla) before playing and losing your money. The location of the casino is just perfect and a live band makes the experience even better. Little cute castle from the 14th century with stunning gardens around it. There is a lot more to see and to do in this area, but too much for this post, but I hope I have given you a reason to travel to this part of Spain so you can discover it yourself. Barcelona is only an hour away if you take a TGV. So you can go to the big city as a day trip from here. Hope you enjoyed reading about our fantastic trip in Empuriabrava, Spain. If you have any questions, please let us know, maybe we can help you!